"Hi, Chuck Acri here! ", was the weekly greeting from the the amiable host of the Acri Creature Feature. Chuck Acri was, and still is, a business man and a bit of a showman. When the syndicated package of horror movies known as Creature Features came to the market, WQAD newcomers Bill Flannery and Don Raymond produced the local show, beginning with a few specials in 1969. Chuck Acri, who had previously been buying ten second spots of air-time asked to become the sponsor to promote his home improvement business, The Acri Company. Vincent and Emmit became local stars. Flannery and Raymond's input continued through the early seventies whereafter Acri continued the show through 1977. Acri's ambitious marketing and distribution of the program spread its reach from the Quad Cities (WQAD) (Moline, IL; Davenport, IA; Bettendorf, IA; and Rock Island, IL. ), including Milan, IL., to Cedar Rapids, Iowa (KCRG) to Peoria (WEEK) and Springfield (WICS), Illinois. This gamut of locales and timeframes created a legion of fans with slightly varying memories of characters and specifics, but an over-arcing love of the show. Acri's Creature Feature may have had the widest distribution of a local, hosted TV horror movie program. and also starring Fang, the wonderdog. 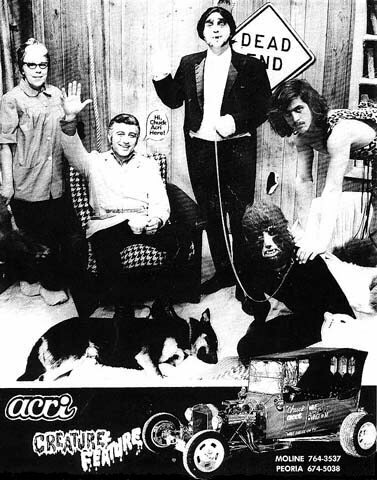 produced and hosted the early version of the program. Click on the secret passage! The first time I saw the Acri Creature Feature on Dec. 26th, 1970, I was hooked. Its free-spirit and campy nature greatly appealed to adolescent males. In those days, the show began with a wide shot (on 16mm b&w film) of an old white wooden two-story house (probably in a rural location near Moline). The camera zoomed toward the front window while the familiar theme song played ... >>>> >>>> >>>> >>>> continued on the Fan Memories Page! Fan Memories Page Two! featuring a special article by writer Steven Philip Jones. Fan Memories Page Three! those old creeps just keep coming out of the woodwork! The Acri Creature Feature on the Internet! E-gor's Chamber of TV Horror Hosts has an entry on the Acri Creature Feature. Scroll down to Chuck Acri. Scary Monsters Magazine's issue with the Acri Creature Feature Family Album reprinted. Mike's memories; scroll half-way down for his nostalgic entry. We'd love to read your memories of watching the Acri Creature Feature and/or the Captain Jinks show! Please email drjitters [at] gmail [dot] com or sign our guest book. Thanks to: Phil from Dubuque, Dave Epland, Dave France, Ed Young, Rich Birley, Bob Theman, Steven Philip Jones, Michael Isenberg, Tim Acri and of course Chuck Acri & his creeps. This page is dedicated to Ken Gibson. Craft, Dan. 2000. "Legends of Late Night." In Bloomington Pantagraph, October 26, GetOut entertainment section. Unlock the old trunk of treasures!